By Andrew Teh, D.O., Aswin Kumar, D.O., Claire Teh, OMS II, Lea Alhilali, M.D. Of the major salivary glands, the parotid gland has the highest rate of tumor association, accounting for 64% to 80% of primary epithelial salivary gland tumors. Most parotid tumors are benign with malignancy only comprising approximately 15% to 32%.1 The typical clinical presentation is a painless mass or swelling in the cheek about the mandibular rami. 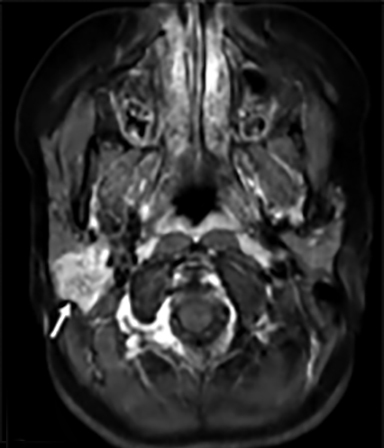 Facial nerve involvement generally suggests a malignant tumor, which may present with pain or paralysis. 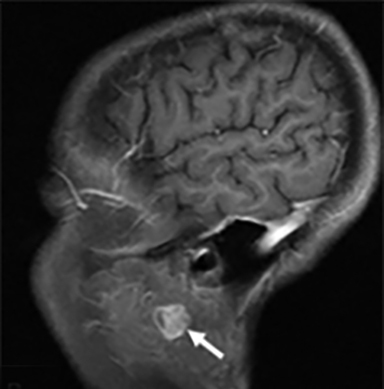 Imaging studies provide insight on the degree of glandular involvement, the nature of the tumor, and potential spread, and serve as an important baseline for therapeutic interventions. 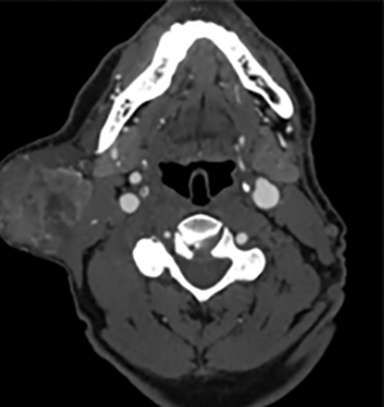 Familiarity with the normal anatomy of the parotid gland, as well as the imaging characteristics of common neoplasms involving the parotid gland, is crucial in establishing appropriate differential diagnoses and guiding clinical management. Pleomorphic adenomas, commonly referred to as benign mixed tumors (BMTs), are the most common benign salivary gland tumors (70% to 80%). Initially presenting as a slow-growing, painless cheek mass, these neoplasms typically appear in middle-aged females 30 to 60 years old.2-3 They are mixed tumors comprised of epithelial and myoepithelial cells. On US, the appearance of BMT is a homogeneous hypoechoic, well-circumscribed mass. A nuclear medicine (NM) pertechnetate scan shows a photopenic/cold defect, differentiating them from a Warthin tumor (typically hot), but the appearance is indistinguishable from malignant parotid lesions (usually cold).4 CT will demonstrate a well-circumscribed, homogeneously enhancing ovoid mass. 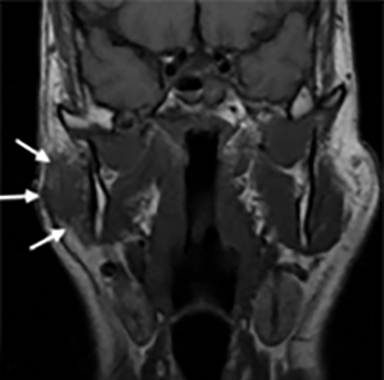 Larger BMTs can show some heterogeneity to their enhancement pattern and may even present with central necrosis or dystrophic calcifications.5 T1 MRI sequences show a homogeneous hypointense mass, with larger BMTs showing hyperintense foci in cases of intratumoral hemorrhage. T2-weighted sequences will show uniform intermediate to high signal (Figure 1); very high T2 intensity greater than cerebrospinal fluid is fairly specific for BMTs. 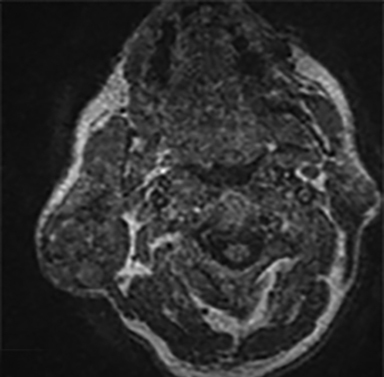 Diffusion-weighted imaging (DWI) usually shows higher apparent diffusion coefficient (ADC) signal compared to other parotid tumors, but this is not accurate enough to preclude biopsy. Contrast studies vary, ranging from mild to moderate enhancement (Figure 2). The incidence of malignancy is <1%. Management involves either surgical excision or routine monitoring, which can be advantageous to avoid iatrogenic complications.7 Local recurrence is exceedingly rare but more likely in multifocal disease. 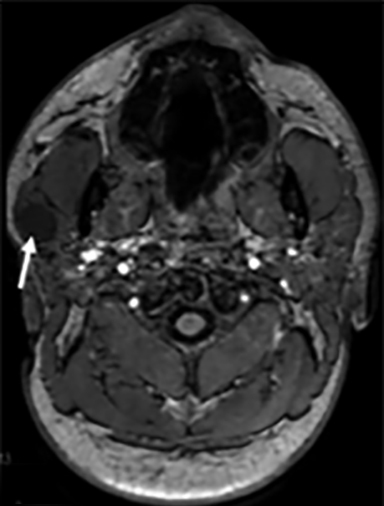 Facial nerve schwannomas (FNSs) are rare benign neoplasms arising from Schwann cells along cranial nerve (CN) VII, the facial nerve. 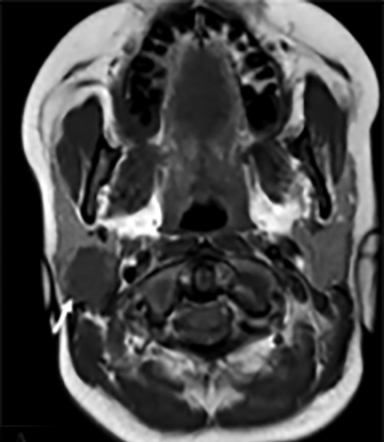 In the parotid parenchyma, they may present similarly to pleomorphic adenomas as a painless and slow-growing mass. Uncommonly, they present with facial weakness or paralysis. 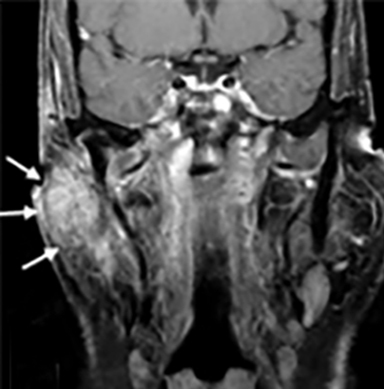 Multiple schwannomas have an association with neurofibromatosis type 2 (NF-2). Preoperative diagnosis of FNS is extremely difficult and uncommon. Diagnosis is often made intraoperatively via electrical stimulation and tissue biopsy, followed by radiographic staging to determine neoplastic extent.10,12 Total resection is curative; however, this may be declined if the nerve cannot be salvaged. 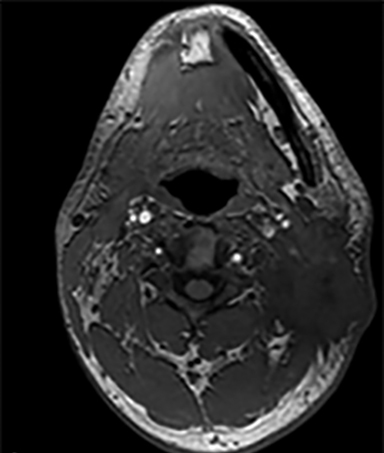 Metastases should be a consideration for parotid lesions in patients with a known malignancy, especially head and neck malignancy, such as squamous cell carcinoma. Skin lesions involving the face and scalp, such as squamous cell carcinoma or melanoma, account for the majority of parotid metastases. Systemic metastases to the parotid gland are extremely rare, usually originating from lung or breast cancers. >Parotid masses have a variety of etiologies that range from benign to malignant. 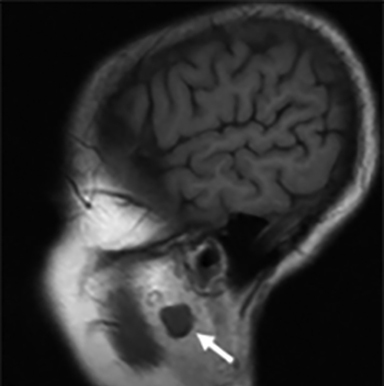 Although many lesions have some overlapping features, imaging appearance and patient demographics often aid in narrowing the list of differential considerations. 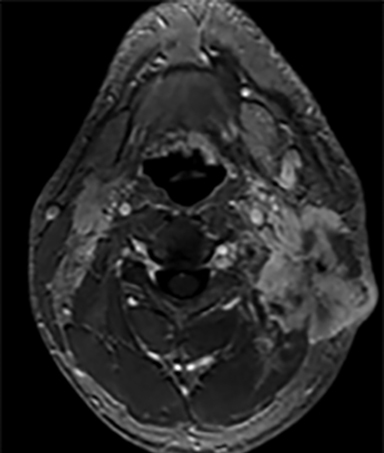 Familiarity of the imaging characteristics of common parotid masses is critical in providing a comprehensive evaluation that includes determining lesion etiology, assessing staging for malignant lesions, and guiding overall management. Eveson JW, Auclair P, Gnepp DR, et al. Tumours of the salivary glands. In: Barnes L, Eveson JW, Reichart P, Sidransky D, eds. Pathology and genetics of head and neck tumours, 1st ed. Lyon, France: IARC Publications; 2005:212-213,242-243. Som PM, Shugar JM, Sacher M, et al. Benign and malignant parotid pleomorphic adenomas: CT and MR studies. J Comput Assist Tomogr 1988;12(1):65-69. Thoeny HC. 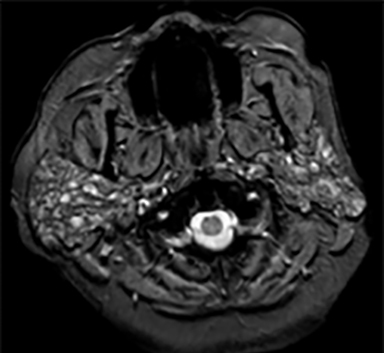 Imaging of salivary gland tumours. Cancer Imaging 2007;7(1):52-62. Kulkarni M, Shetkar S, Joshi P, et al. Incidental Warthin tumor on pertechnetate scintigraphy. Clin Nucl Med 2016;41(9):728-729. Yerli H, Aydin E, Coskun M, et al. 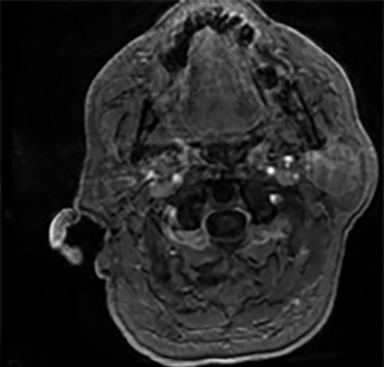 Dynamic multislice computed tomography findings for parotid gland tumors. Comput Assist Tomogr 2007;31(2):309-316. Moonis G, Patel P, Koshkareva Y, et al. 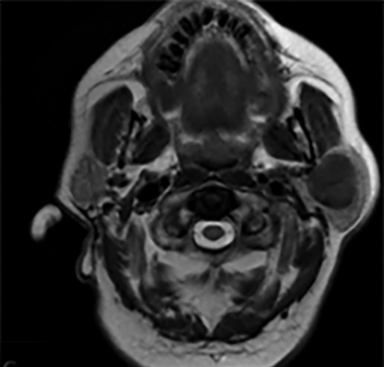 Imaging characteristics of recurrent pleomorphic adenoma of the parotid gland. 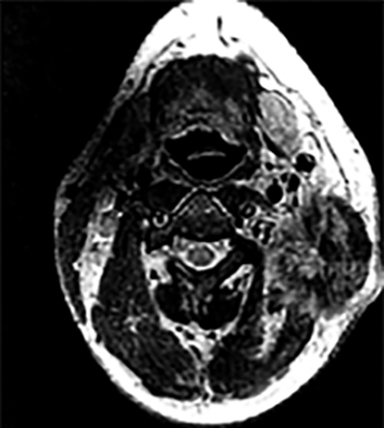 Am J Neuroradiol 2007;28(8):1532-1536. Espinoza S, Felter A, Malinvaud D, et al. Warthin’s tumor of parotid gland: surgery or follow-up? Diagnostic value of a decisional algorithm with functional MRI. Diagn Interv Imaging 2016;97(1):37-43. Abdullah A, Rivas FR, Srinivasan A. Imaging of the salivary glands. Semin Roentgenol 2013;48(1):65-74. Yabuuchi H, Matsuo Y, Kamitani T, et al. 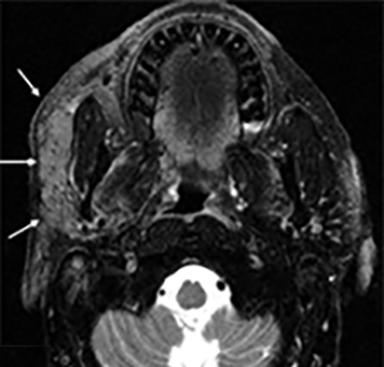 Parotid gland tumors: can addition of diffusion-weighted MR imaging to dynamic contrast-enhanced MR imaging improve diagnostic accuracy in characterization? Radiol 2008;249(3):909-916. Damar M, Dinc AE, Elicora SS, et al. 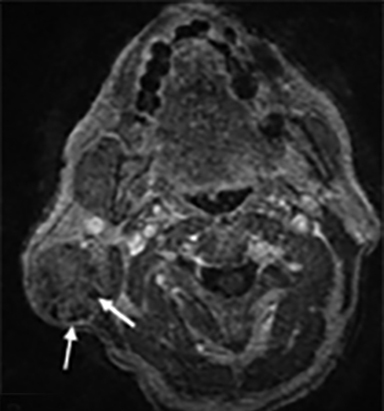 Facial nerve schwannoma of parotid gland: difficulties in diagnosis and management. Case Rep Otolaryngol 2016;2016,1-4. Lee YY, Wong KT, King AD, et al. 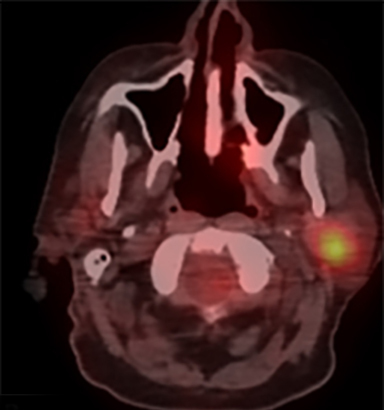 Imaging of salivary gland tumours. Eur J Radiol 2008;66(3):419-436. Caughey RJ, May M, Schaitkin BM. 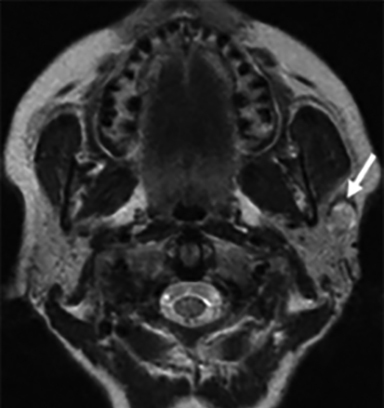 Intraparotid facial nerve schwannoma: diagnosis and management. Otolaryngol Head Neck Surg 2004;130(5):586-592. Martinoli C, Pretolesi F, Del bono V, et al. Benign lymphoepithelial parotid lesions in HIV-positive patients: spectrum of findings at gray-scale and Doppler sonography. Am J Roentgenol 1995;165(4):975-979. Jeong HS, Lee HK, Ha YJ, et al. Benign lymphoepithelial lesion of parotid gland and secondary amyloidosis as concurrent manifestations in Sjögren syndrome. Arch Plast Surg 2015;42(3):380-383. Schneider M, Rizzardi C. Lymphoepithelial carcinoma of the parotid glands and its relationship with benign lymphoepithelial lesions. Arch Pathol Lab Med 2008;132(2):278-282. Yadav R, Battoo AJ, Mir AW, et al. 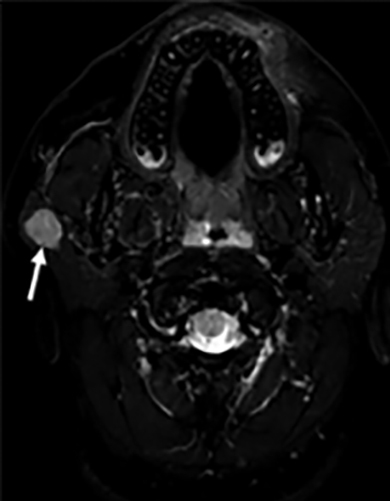 Bulbar conjunctival metastasis from mucoepidermoid carcinoma of parotid—a case report and review of literature. World J Surg Oncol 2017;15(1):10. Lewis AG, Tong T, Maghami E. Diagnosis and management of malignant salivary gland tumors of the parotid gland. Otolaryngol Clin North Am 2016;49(2):343-380. Ko JJ, Siever JE, Hao D, et al. 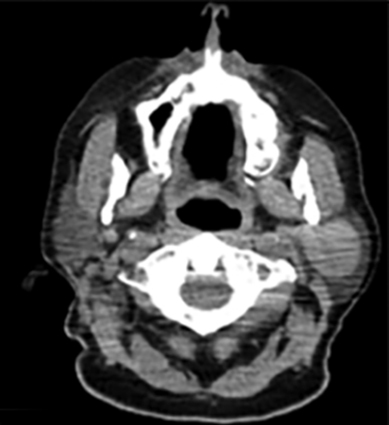 Adenoid cystic carcinoma of head and neck: clinical predictors of outcome from a Canadian centre. Curr Oncol 2016;23(1):26-33. Aydin S, Demir MG, Barisik NO, et al. 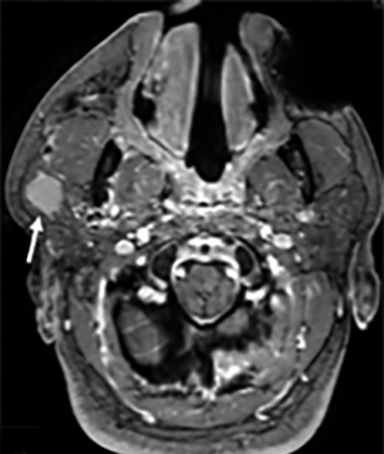 Extranodal marginal zone lymphoma of the parotid gland. J Maxillofac Oral Surg 2016;15(Suppl 2):346-350. Teh A, Kumar A, Teh C, Alhilali L. Overview of Parotid Gland Masses. J Am Osteopath Coll Radiol. 2018;7(4):5-10. Andrew Teh, D.O., Aswin Kumar, D.O., Claire Teh, OMS II, Lea Alhilali, M.D. Dr. Kumar is with the Department of Radiology, Larkin Community Hospital, South Miami, FL; Ms. Teh is an OMS II with the Touro University Nevada College of Osteopathic Medicine, Henderson, NV; Dr. Alhilali is with the Department of Neuroradiology, Barrow Neurological Institute, Phoenix, AZ.